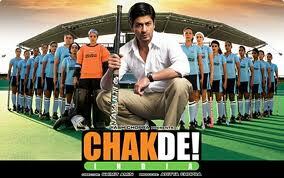 Chak De India is a 2007 Bollywood movie produced under the banner of Yash Chopda. The story in the movie goes side by side with the Indian hockey team and the mental aspect arisen between the players, coach and the audience. Sharukh Khan is in the lead role in the movie who is a player and a coach of the female hocky team. Khan was the captain of the Indian hockey team when they lose the final match against the Pakistan. When various questions were raised against him after Pakistan won the match, he was under the shadow for seven years. And finally he came in the main stream as a coach of female hockey team to erect the mistake he had made earlier and to drive the Indian hockey team to a paramount. Chakde India is a social movie that comprises the entire human and the behavioral aspect of the human beings. The human attributes like motivation, perception, leadership, psychology, and team dynamics are clearly and explicitly presented in the movie. In this regard, we can call ‘chakde India” as a behavioral movie. The movie starts with the hockey final match between India and Pakistan. Indian captain Shahrukh Khan misses the penalty and looses the match. After the completion of the match, the handshake between the players misinterpreted by the media and the public which costs him a lot, his career, pride and a lot more. He becomes passive for 7 years. And when he returns back, he comes with an enthusiasm to erase his dishonor and to uplift the Indian Hockey team. The movie Chak De India is organizational behavior put in practice. It consists of the organizational behavior topics like leadership, team formation, norming and storming of team work, group dynamics, personality, motivation, etc. All these concepts are presented with the parallel story of Indian female hockey team. The most important aspect of the movie is team building process. The players from various states with different ethnic background, language, culture, personality and attitudes come upon a team to play together with a common goal i.e to play for the country. It also showed that goal can be easily achieved if they work on the team with the shared values and motives. In the movie, comparatively a weaker team went up to the hockey finals and won against the strong team Australia. The movie also shows the role of an effective leader to inspire and motivate the team fo find out an extraordinary results. To find the goal, right person should be placed in the right place at the right time by knowing the individual difference. Organizational goal must be synchronized with the personal goal in order to increase the efficiency. All these traits of leadership are beautifully presented in the movie from the leadership lesson of the main character Salim Khan. Motivation and belief are another of the important topics shown in the movie. The coach is first self motivated and he believes in himself and only then he is able to motive his team members and make them believe that they are able to achieve the unachievable. Khan even uses negative motivation techniques to motivate the team. He do not let play the players who do not play seriously or do not obey the disciplines. To unite the team into one, he stands as the enemy so that the team can bond together. Ckakde India is one of the finest movies not only from the perspective of knowledge and behavior, but also from the entertainment side too. The characters develop the story in a spontaneous manner with the flavor of organizational behavior. It shows how different people with different personalities and backgrounds can come together and achieve the impossible when they are able to work as a team eradicating individual weaknesses through each other’s strengths. It also shows us how an effective leadership personality can emerge and can lead the whole group to transform into a team through motivation and other techniques. Formation of work group and team: There are following steps by which a team or work group is formed. Forming stage: This is the first stage which is characterized by uncertainty. A common goal brings people together. • Hockey players from different Indian states meet at Delhi to form India’s women hockey team. • The players have different personalities, backgrounds, attitudes and different skills. • All these different players come together to form a diversified workgroup. Storming stage: Immediately after forming stage, storming stage starts. • The players from different state are put together randomly. • Conflict arises when players differ in their opinions about how they should get the beds. • The coach motivates using negative comments to each player by shouting and punishing them by keeping them in a bench until they apologize. • Keeping players on constant stress by training rigorously which include 4a.m 10 km runs and strong criticism of their performance in an effort to make them work together. • The weaknesses of the group members may become vivid in this stage of group formation. Norming Stage: This is the longest stage where constructive conflict and team bonding is expected. • Leaders do emerge themselves in group naturally, Bindia Naik emerges as a leader in the group in various occasions like in a scene she made all the players to sign to demand the resignation of the coach. • The group of girls who don’t get along that well unite as one when they get the challenge to play against boys’ team for a chance to appear in the world cup. • The bonding of the group even becomes more intense when they unite once again to fight against bully from the boys in the café. Performing stage: When the goals, rules and roles are clear and accepted then people start delivering. But this will not guarantee a winning performance. • In this stage the group start to work together and they start to perform towards one goal. • The coach with the confidence in his group challenges the boys’ team and wins their admiration. • The victory with England, Spain, New Zealand, South Africa, Argentina and South Korea shows the women at performing stage. Formation of Team: Only when Koumal passed the ball to Preeti and made an equalizer in the final game, the team was actually formed. • Both Preeti and Koumal were had their personal goals but putting their personal goals aside they gave higher priority to the team’s goal and hence they worked together to equalize and in the end Preeti gave her penalty shootout chance to Koumal. This shows how the team has bonded and worked together to fulfill their team’s goal. • The scene of Kabir Khan, the captain of Indian team shaking hands with the captain of Pakistan team as a gesture of sportsmanship is misinterpreted and is perceived as a traitor. Kabir Khan, being of Muslim origin himself is accused of deliberately missing the penalty shoot. This shows how a misinterpretation of information can bring the change in the way people perceive things. • Kabir khan was judged on the basis of his one failure and not his qualities or other achievements as a result of Halo effect. • The second perception example is of the scene when no one is willing to take charge of the women’s hockey national team. People perceived the women’s team as an insignificant and thought they would never win and thus was not worth taking the charge of the team. • Further the claim of the committee that one and the only long term role for women is to “cook and clean” in the kitchen rather than playing hockey in the field is a stereotypical comment in itself. • The suggestion made by Preeti’s fiancé who was the newly appointed vice captain of Indian National Cricket team, also shows how he perceived the women’s hockey as unimportant. He claims that Cricket is the only significant game and she should be his wife and enjoy her life as his wife and not a hockey player. • The stereotyping is further vividly shown in the movie when the players who have come from Jharkhand are perceived as jungles (people living in jungle and players who have come from north India as Nepalese or Chinese. • Leaders are visionary. The statement of “what is thought to be impossible is to be done” i.e. “Jo ho nahi sakta wohi to krna hai” shows the vision is the coach and further taking that challenge and conveying that same vision to all the group members shows the leadership and visionary trait of the coach, Khan. • Leaders take the challenge as an opportunity. In the movie Kabir Khan’s first challenge is to get into the job of the coach of Women’s Hockey Team and the second challenge is to lead them to the World Cup victory and he takes such an impossible challenge and converts it into an opportunity to answer Indian viewers against the blames which were made against. • Leaders are able to understand the situations and act accordingly. As in the beginning Kabir Khan used the negative motivation by suspending the players who did not give the desired behavior, and then he also used the negative motivation to bring the team closer. However in the later part of the movie he has used the other motivational tools to inspire the team and bring out the desired outcomes. • Leaders should recognize individual strengths and weaknesses and assign tasks accordingly for the fulfillment of organizational goals. • The leader should be fair am impartial while dealing with team members. For and instance when Kabir Khan selects the new comer as a captain rather than then selecting senior experienced player (Bindiya). • Leaders are self motivated. The first and foremost of the motivation has to start from oneself. Only when one is able to self motivate he/she can motivate the whole team he is leading towards the goal. • Intrinsic: When they played against men’s team, the negative comments given by committee motivated them and raised their pulse and confidence. • Extrinsic: The coach telling Preeti and Koumal about how they can make or ruin the match, as he was trying to explain to play the match in the team instead of thinking individually. The crucial 90 minutes just before the final match motivated and helped them to get best out of them and created a “do or die” situation. • Conflict exists in the movie naturally and sometimes is induced deliberately by the leader. The differences between the girls creates a natural conflicting situation. However Kabir Khan also creates conflicts between himself and the team so as to bond the group together to form a team. The victory of Women hockey team had changed the life of players as well as the coach. • Koumal’s father, who initially was against her playing hockey changes his opinion and is more supportive at last. • Preeti’s refusal to the proposal of her fiancé because she wanted to make a name for herself and not be a shadow of her husband is also a change. • The Punjabi girl is able to control her anger and use her strength for the benefit of the team. • The press reports of Kabir as a hero and praises him forgetting the past that had almost ruined everything for him. When there is determination, past failures and injuries motivate to win. One’s biggest failure may turn out to be the ladder to success, if personal odds are overcome and energy channelized in correct direction rather than wallowing in self pity and low self esteem. • The past event of the coach has motivated him to work for the team spirit. • The team does learn from the mistakes they make and from the turn of events they face. The movie Chak De India is a very well researched and well made movie which has all the Organizational Behaviour theories put into practice. It serves as a great way to learn about the subject matter. The teaching methodology with the help of a movie is a good thing in itself. We have been well benefitted with the effort as we have been able to see how the theoretical knowledge that we have gained into the practice. The Organizational Behaviour subject matters like personality, leadership, motivation, teamwork, learning etc all have been addressed by the movie. It is a great initiation, so thanks for your work. Ramesh, you have analyzed movie “Chakde India” beautifully from perspective of OB. all the contents are really awesome.. it really helped me a lot. thankyou.